Pope Benedict XVI in the U.K. The headline around the world was that the Pope was finally allowing the use of condoms in certain circumstances. The news came after an Italian newspaper broke an embargo on a book-length interview with Benedict XVI by the German journalist Peter Seewald, perhaps the only popular interlocutor whom the Pontiff, in his previous role as a Cardinal, has cooperated with on such a scale. Benedict's so-called condom concession was not a huge one. He still proscribes the use of condoms as contraception (as he does the birth control pill). His specific example, that of a male prostitute choosing to use a condom in a conscious choice to prevent HIV infection, is couched as "a first step in the direction of moralization, a first assumption of responsibility, on the way toward recovering an awareness that not everything is allowed and that one cannot do whatever one wants." Benedict seems to imply a scale of good and bad intentions  from the indiscriminate use of condoms and other contraceptives to the idea of preventing the spread of AIDS to following the teachings of the Catholic Church. Condoms are not the ultimate solution or the prescribed Catholic way, he reiterates, though Benedict allows that there is little the church can do to prevent anyone from acquiring condoms. Still, he insists that "the sheer fixation on the condom implies a banalization of sexuality ... the dangerous source of the attitude of no longer seeing sexuality as the expression of love." Benedict's statement about condoms is part of Light of the World: The Pope, the Church, and the Sign of the Times, Seewald's far-ranging, six-hour interview, which is to be published by Ignatius Press. The Pope supplies often frank and personal responses. Indeed, Benedict admits that he was "provoked" by a reporter's question during a 2009 press conference that called the Catholic Church's approach to AIDS "unrealistic and ineffective." He responded to the question by defending the enormous amount of work done by religious organizations worldwide in treating "AIDS victims, especially children with AIDS." "The Church does more than anyone else," he told Seewald. "And I stand by that claim." Seewald and the Pope discuss numerous subjects, from the church's child-abuse scandal to homosexuality to papal retirements to the Book of Revelation. For the most part, Benedict is surprisingly open, though unsurprisingly wedded to orthodoxy, even as he defends it spiritedly. At times, he is almost relativistic, preferring to read the Bible in symbolic ways rather than with a hard-edged literalism. For example, while he says that Christians must always look forward to the coming of Christ, it must be in a continuously spiritual way, and that a believer must not look for that return "in a chronological sense," which "would be false." Indeed, the Pope argues against a literal interpretation of the biblical book so often used by doomsayers to herald the end of the world. "The important thing is that every period open itself to the presence of the Lord." And yet he can cite the Bible and tradition in iron-clad ways, for example, in the case of female priests. 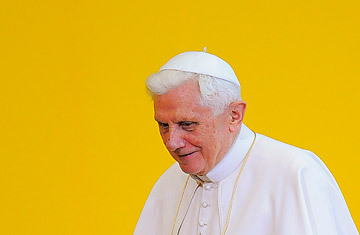 Benedict reiterates his predecessor John Paul II's position: "The Church has 'no authority' to ordain women. The point is not that we are saying that we don't want to, but that we can't"  that is, because there is no biblical or historical basis for it. Even though he says that "Jesus brought women into a closer relationship with him than had been thinkable before his time," he says women can shape the church in more powerful ways than men without having to be priests. He admits that the abuse scandal is a terrible crisis. "As a result the faith as such becomes unbelievable, and the Church can no longer present herself credibly as the herald of the Lord," he says. He discusses at some length the scandal in Ireland and how "it was a surprise [to him] that abuse also existed on that scale" in his native Germany. That admission, however, brings up an unanswered and perhaps unasked question about an incident that occurred during the Pope's brief administration of the church in the German city of Munich when he was Archbishop Joseph Ratzinger. In 1980, Ratzinger personally authorized the transfer of an abusive priest, Peter Hullermann, from another part of Germany to his own archdiocese, ostensibly for therapy. But just days after his arrival, the priest was allowed to serve among the flock. Hullermann was convicted of subsequent sexual assaults in 1986. The Vatican insists that, like other Archbishops, Ratzinger wasn't responsible for the parish assignments of priests, even those with a history of abusing children. In the interview, the Pope says something that seems tangentially relevant. "It is never permissible ... to steal away and to wish not to have seen it and to let the perpetrator continue working. It is therefore necessary for the Church to be vigilant, to punish those who have sinned, and above all to exclude them from further access to children." But it is curious that the text of the interview does not address the Hullermann incident explicitly. Seewald has not responded to a TIME query about whether the Hullermann case came up during his conversation with Benedict XVI. Seewald broaches the idea of resigning, which many of the Pope's critics called for when revelations about the abuse crisis peaked in April. Benedict is adamant in his response: "When the danger is great one must not run away." But the 83-year-old Pontiff does say that, contrary to perceived papal tradition, Popes should be able to consider resignation. "If a Pope clearly realizes that he is no longer physically, psychologically, and spiritually capable of handling the duties of his office, then he has a right and, under some circumstances, also an obligation to resign." And Benedict, who admits that he does not use an exercise bike that was set up for him, tells Seewald that "I also notice my forces are diminishing." Early on in the interview, Seewald calls Benedict "the most powerful Pope of all time" because of the church's burgeoning army of believers the world over. But Benedict dials it down. "Among those 1.2 billion Catholics are many who inwardly are not there," he says. "Stalin was right in saying that the Pope has no divisions and cannot issue commands. Nor does he have a big business in which all the faithful of the Church are his employees or his subordinates ... In that respect, the Pope ... is a completely powerless man."